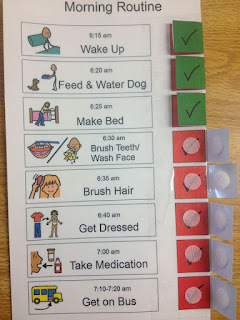 Simplifying the Morning Routine - I Love ABA! ABA therapy can be used to teach/increase a variety of adaptive skills, such as tooth brushing, toileting, hair brushing, shoe tying, making a bed, etc. My favorite definition of an adaptive skill is anything that will have to be done for the learner, if the learner does not learn the skill. So if I don’t teach my child how to dress him/herself, then I will have to dress my child. 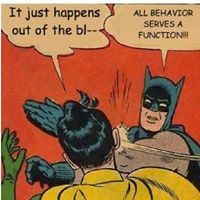 A common concern many of my clients have around adaptive functioning is the dreaded Morning Routine. 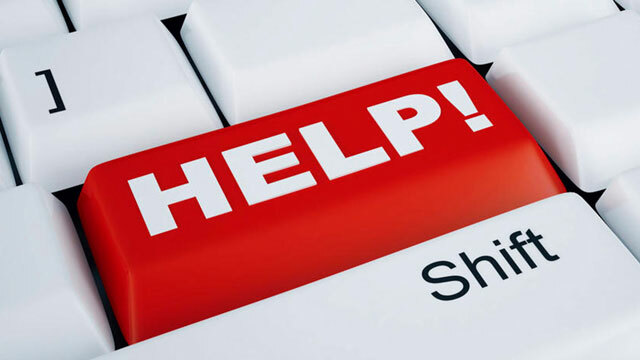 Since my clients are usually school age, I have ample opportunity to help families target issues that regularly pop up during that frenzied time in the morning of trying to get the child out of the door on time. Issues like: task refusal, off task behavior, prompt dependency, skipping steps of the routine/completing the routine out of order, etc. 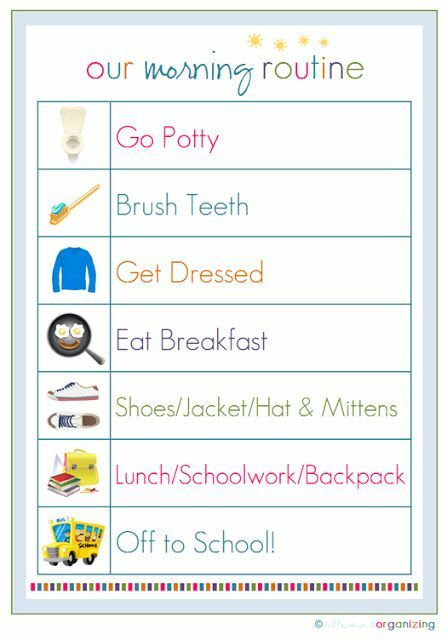 With some simple tweaks here and there and adding in more supports, the morning routine can be less stressful, more efficient, and require less intrusive prompting which equals more independence for your child. 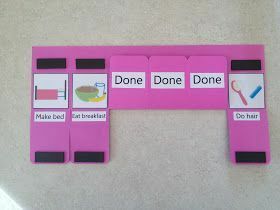 - Add visuals: I say “add visuals” and not “add more visuals”, because usually what I see is that families who struggle the most with the morning routine are not using any visual supports. If you are regularly struggling during the morning routine but you already have visual supports in place, then that’s a gold star for you. You are ahead of the game. If you are new to visual supports, just keep reading. 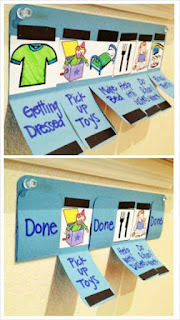 Think of a visual support as a way to minimize prompting or assistance. 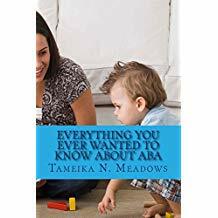 If you have to stand in the bathroom doorway, physically assist your child, or keep giving the same demand over and over (“Make up your bed Evan ……. Evan, did you make your bed?”), then you definitely need to add some visuals. It is much easier to fade the prompt of a visual, than to fade your voice or your presence. 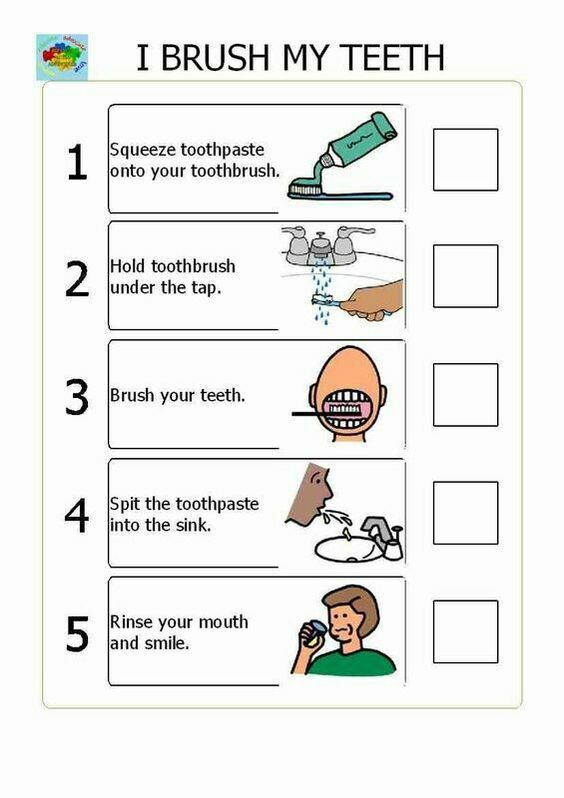 Or to put it another way, do you want to have to stand in the doorway to make sure tooth brushing happens when your child is 25? 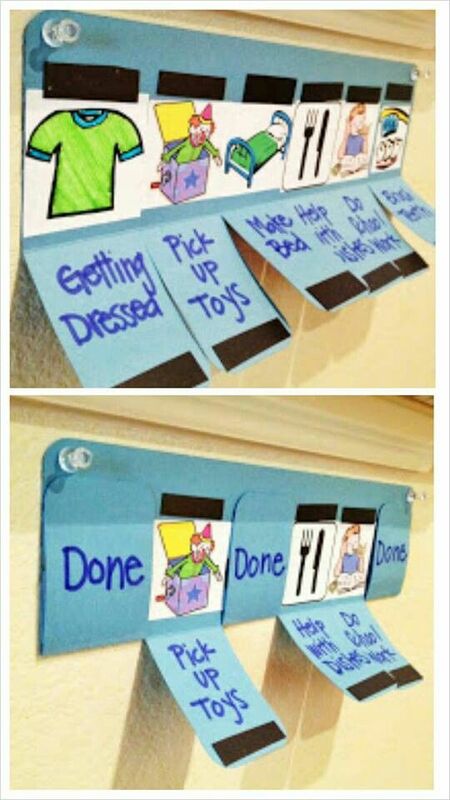 Here are some awesome examples of visual supports, all were found on Pinterest. - Auditory cues: The use of a timer can be such a helpful addition to the morning routine because time is usually of the essence. We have to go, and we have to go now. For many of my defiant kiddos, those with attention issues, or those with lots of escape maintained behaviors, the simplest demand (e.g. “Put your socks on”) can take ages and ages to actually happen. Decide on a specific amount of time for the skill to occur, and then set a timer. If the child can beat the timer, then allow them to contact reinforcement. Depending on the child, this could mean a treat, getting to pick what they wear that day, 2 minutes of TV time, etc. 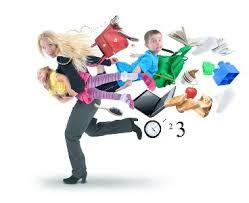 Make the concept of “hurry up” more concrete by helping the child understand how quickly tasks needs to be completed. - Organization: This tip is more for you than the child. Organization or proper set up for the morning routine does not begin that morning, it begins the night before. 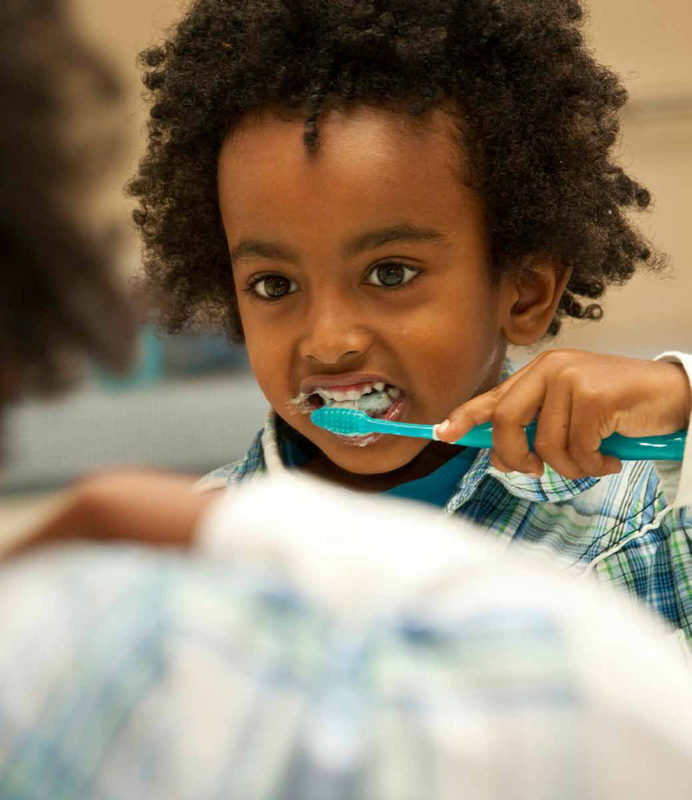 Part of the bedtime routine can include setting up items for the next day. This could mean lining up the soap, facetowel, toothpaste, and toothbrush by the bathroom sink. Or this could mean putting the backpack by the front door, so there is no frantic search for it in the morning. How you organize will depend on the specific issues you are having in your home. The point is to set the child up for success. 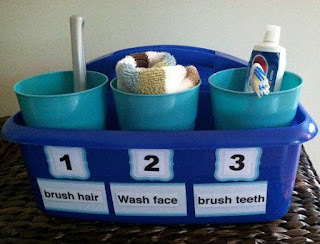 For younger children (especially if you want to increase independence) line up needed items/materials in their correct order so your assistance is not needed. For example, in the bedroom line up underwear, socks, pants, shirt, and shoes. In the kitchen, line up the bowl, spoon, and cereal box. 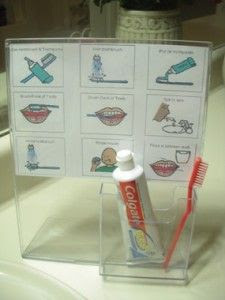 For some children you may need to put number cards on each item (e.g. put a "1" card on the underwear). Any step you can do the night before will save precious time the next morning, and the materials being visible helps serve as a prompt of what to do next. *Bonus Tip: A good way to practice the skills required for a successful morning routine is to incorporate weekend practice. If these skills are only performed M-F with a time crunch, then you’re setting yourself up for lots of frustration. 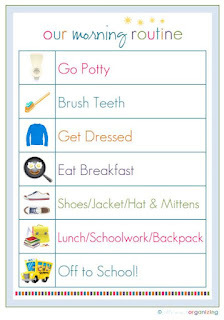 On the weekends, still have your child go through the morning routine. Use this to fine- tune skills, or provide more repetition than is possible on a Monday morning. 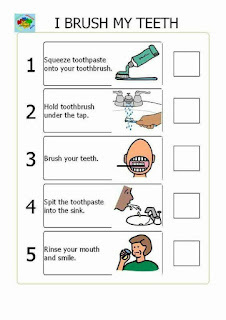 If tooth brushing is always a struggle, consider modifying the visuals or making them larger/more detailed. Try removing yourself, and only checking on your child periodically. 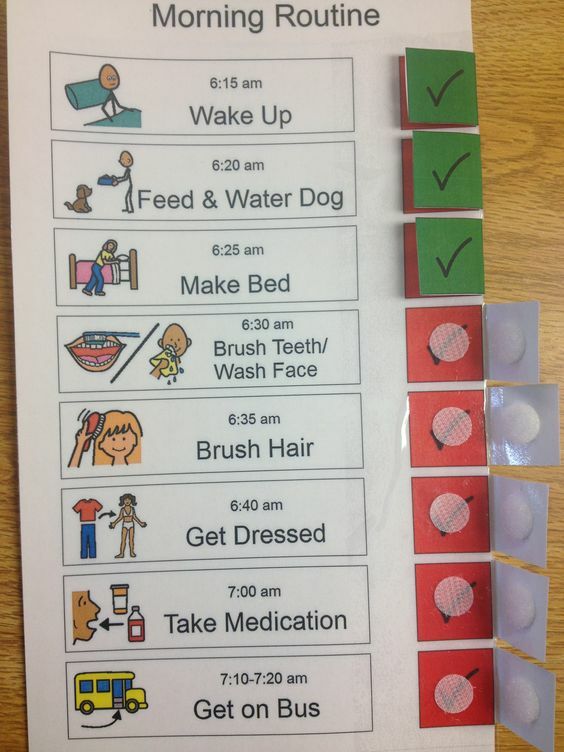 If the child is older or needs less support, try implementing a checklist that the child completes. As they perform each skill, they check a box. When all the boxes are checked they bring the checklist to you for review.